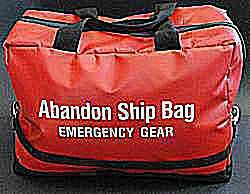 Any sailboat cruising offshore needs among its emergency equipment an abandon ship bag, also called a ditch or grab bag. Even sailors in coastal cruising situations should be prepared with a ditch bag if wind or a current might carry them in a liferaft or dinghy away from a populated area. Never assume, even when you have communication gear, that rescue will come before you would need the things typically carried in an abandon ship bag. Although most liferafts are equipped with some basic survival equipment, also never assume that it has everything you need or may want. Life rafts typically have only minimal gear, because of space and weight limitations, and you can’t unpack them to check or add more. The only way to increase your chances for rescue and survival until rescue is to have a well-stocked ditch bag. Certain items are essential, whereas others depend more on personal needs or preferences. Positive flotation. You might drop it while scrambling to the liferaft or dinghy. Most commercial models such as the one shown have flexible foam sewn into the sides, top, and bottom to provide both flotation and padding. Air trapped in sealed plastic gear bags inside also adds flotation. Water resistant. It need not be waterproof (expensive) because critical items inside can be put in sealed pouches, but you don’t want it to immediately fill with water and possibly sink. Visibility. Most are yellow or international orange. You can improve nighttime visibility by attaching reflector strips, which will shine brightly in a flashlight beam in case you lose the bag overboard, and which may aid in a nighttime rescue. Sufficient size. Be sure your bag is large enough to hold everything you plan to include. If you have many crew, you’ll need a lot of space just for water. Sturdy carry and lanyard straps. Obviously you’ll need to be able to carry it easily off the boat, and in storm conditions you should also be able to easily tie or clip a strong lanyard to the straps before transporting it off the boat. Clearly labeled and stowed. 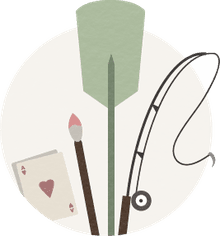 You may know that bag on the quarterberth is for abandoning ship, but everyone else on board must know too because you’ll likely be busy if your boat is going down. Keep the ditch bag it a handy place below decks but near the companionway, where everyone can see it. As you make your list of what to include, consider possible abandon ship scenarios. How long might you have to wait for rescue? (Even with an EPIRB, it could take days.) You can go a long time on little food, but water is essential—and still more in a hot climate. Any chance you might reach an inhospitable shoreline with additional survival time on your own? (Matches to start a fire, etc.) In all cases, you want to include both rescue and survival items along with optional personal or other items. Check your abandon ship bag at the beginning of every season and before a long voyage. Look for expired flares and any tears in water or food packets. (Mice may attack in the off-season!) Replace batteries. Remember the old salt’s saying: You step up into the liferaft when abandoning ship. In other words, stay on the boat unless it is really, truly sinking—many boats have been found floating after a storm, abandoned by panicked sailors. You’re safer on your boat, even half full of water, than in a liferaft or dinghy in open water, and it’s much easier for rescuers to find you. Finally, when going offshore, talk with all crew about their roles in all types of emergencies. Talk about who should grab what if it is necessary to abandon ship. While one or two launch the liferaft and someone else fetches the ditch bag, others can grab additional water jugs, more flares, the ship’s larger first aid kit, a prepared pouch of the ship’s documents and passports, etc.